Traveling with your pet on an airplane is worrisome and sometimes nerve-wracking. In response, some airlines have changed their policies to make flying easier on you and your beloved pet. Here are our picks for the top five. This is one airline where your pet can travel in style. Small pets are permitted to fly in-cabin as long as they’re less than 20 pounds and the carrier is smaller than 17 inches long by 12.5 inches wide by 8.5 inches high. Booking a pet is $100 each way. The airline provides a free pet-friendly travel guide (specific to your destination) once you land. On top of all that, if you fly JetBlue with your pet often enough, you’ll rack up points toward free airfare. For more information, visit jetblue.com. Delta offers a Delta Pet First service, giving pet owners several options for traveling with pets. Small dogs, household cats and birds can travel in-cabin in an approved carrier. Pets traveling in carry-on carriers are charged a $125 fee each way for domestic flights in the U.S. and Canada. Kennels may be checked for dogs and cats, with the exception of snub-nosed breeds. For more information, visit delta.com. The most recent airline to change its animal flying policy (as of July 1, 2009), Air Canada is now allowing small dogs or cats in their planes’ cabins. What’s more, the airline has certified, professionally trained animal care staff on hand to help you with any of your pet care needs. For more information, visit aircanada.com. Southwest Airlines goes out of its way to ensure that pet owners and pets have a smooth flying experience. 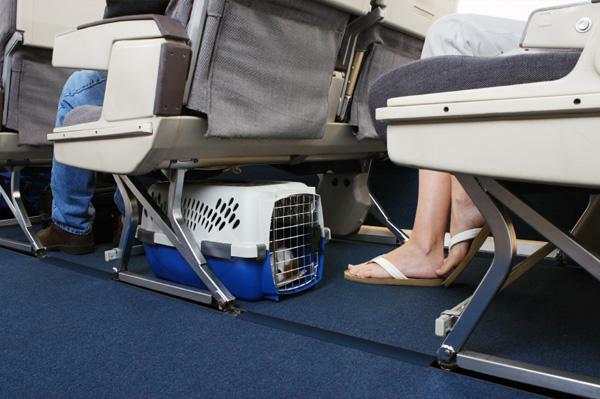 In-cabin pets can fly for $75 per carrier each way in an approved carrier. For a little less than $50, pick up an official branded Southwest Airlines carry-on kennel. As a bonus, two small cats or two small dogs may ride in the same carrier, making this a budget option if your fur babies are small. For more information visit southwest.com. This animal-friendly airline allows almost every type of small animal to board their planes. As long as the animal is small enough, you also can bring him in-cabin with you, storing him in an appropriate holder under the seat in front of you. The only caveat? Certain times of the year carry flight restrictions for certain breeds. Be sure to check their website for more info and to learn about their PetSafe program. For more information, visit united.com. Will your pet enjoy the trip?